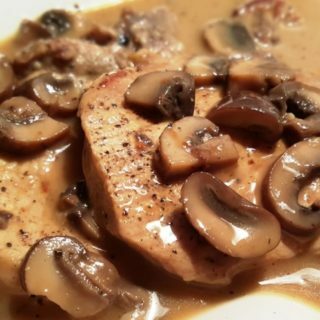 Pressure Cooker Pork Chops in Homemade Mushroom Gravy is made with fresh and all natural, homemade ingredients. No need to use canned cream of soup. 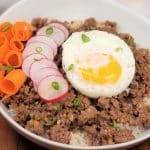 Low carb/keto option in recipe notes. Instant Pot Pork Chops in Homemade Mushroom Gravy is a real comfort food, especially when served over mashed potatoes. Shortcuts are fast, but not always healthy. 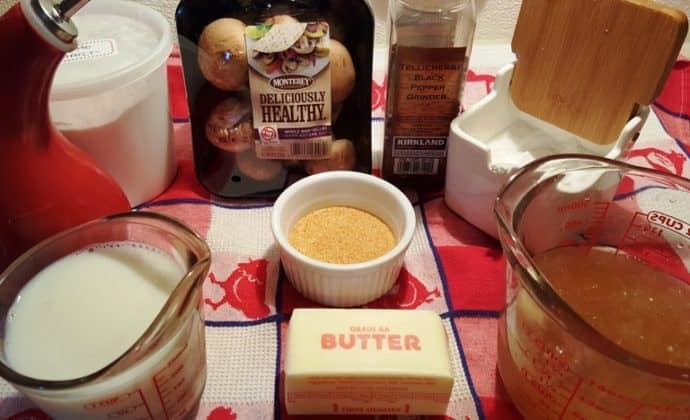 Many recipes call for “Cream of Whatever Soup.” My reaction, “yuk.” I hate canned cream of anything soup, and it’s so easy to make your own homemade version, so why use a can? 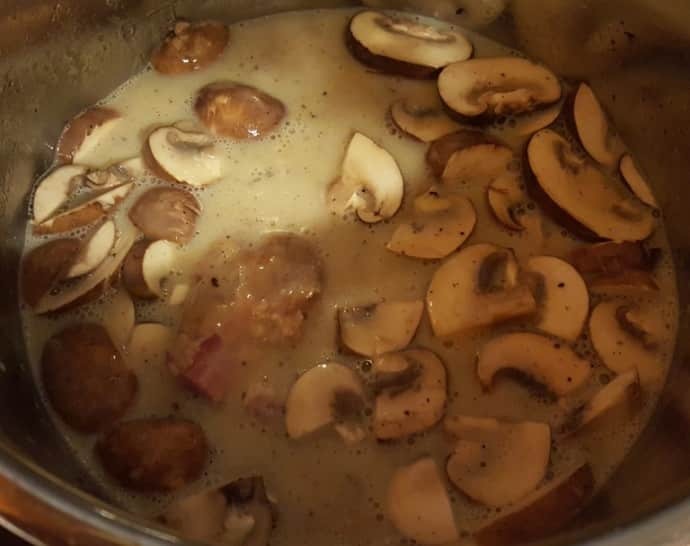 The Instant Pot, Mealthy MultiPot or Pressure Cooker makes quick work of superior homemade cream of mushroom soup in one pot.. I am happy to report that this Instant Pot Pork Chops in Homemade Mushroom Gravy recipe is one of the most popular pork chop recipe around! Can I Use Chicken Bouillon instead of Bone Broth? We usually have containers of Pressure Cooker Homemade Bone Broth in the freezer and simply defrost it in the pressure cooker. 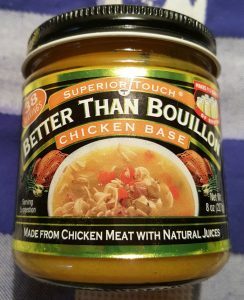 When I am in a hurry, I reach for my jar of Chicken Bouillon Base, which does a fantastic job as well. Vegetable Bouillon Base or a Box of Chicken Broth can also be used. When using Better Than Bouillon Chicken Base, try using a little more than one teaspoon per one cup of water or liquid. You will get more of a concentrated flavor, similar to my Pressure Cooker Homemade Chicken Broth. 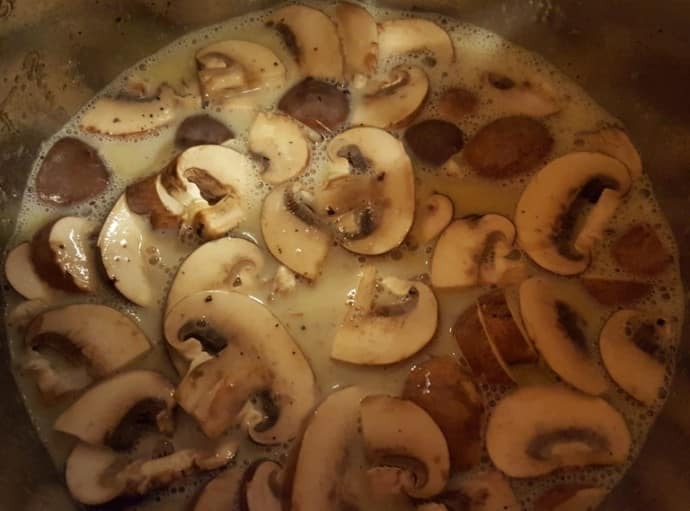 Whisk together your “Cream of Mushroom Soup” ingredients. How to Make Homemade Cream of Mushroom Soup. 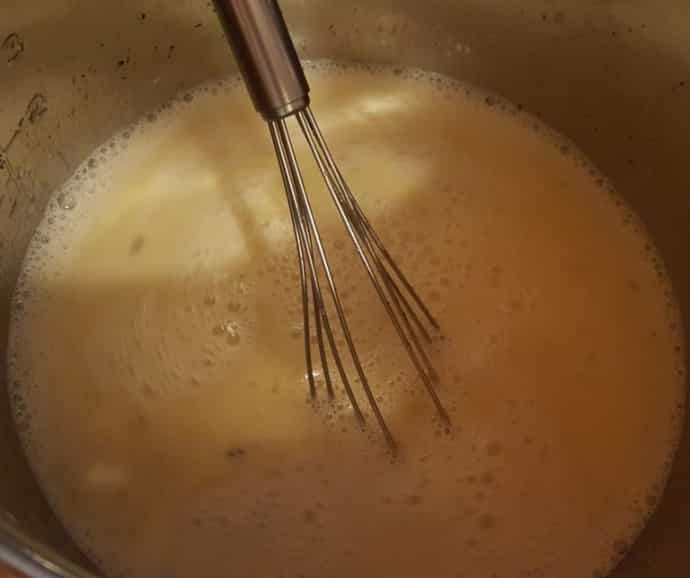 Whisk together cream, bouillon, butter, potato starch, salt and pepper. For a condensed cream of soup, this mixture would cook down in a saucepan. However, using a Instant Pot, Mealty MultiPot or Pressure Cooker there is no need to first make the soup condensed. Potato starch is lighter in texture and in taste. Flour does not work well under pressure. The cook time is so short and the flour does not hae a chance to proper cook and not taste raw. 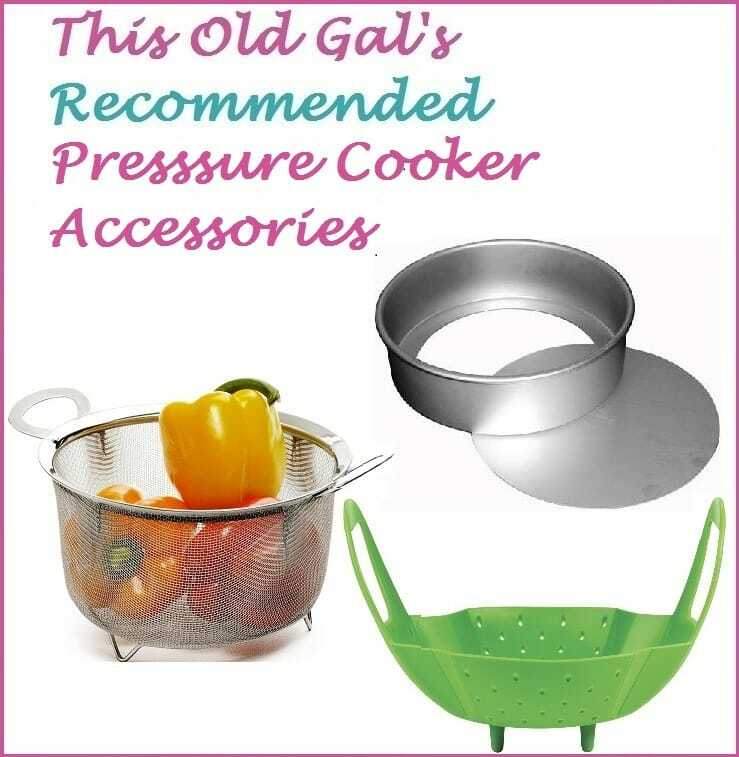 Plus, it may prevent your Instant Pot, Mealty MultiPot or Pressure Cooker from coming to pressure and you may experience the burn notice. 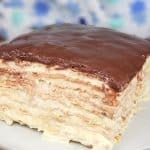 I prefer potato starch over cornstarch for most of my recipes, but for this recipe, I have no preference, as they both work very well. Potato starch is actually great to use as a coating when pan frying seafood, chicken and fish as it prevents the food from sticking to your cooking pot. My Pressure Cooker Salisbury Steak in Mushroom Gravy is a perfect example. 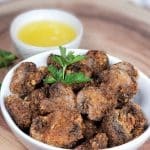 Check out this delicious Air Fryer Crispy Honey Garlic Chicken Wings recipe to see how crispy food gets with potato starch. Use heavy cream in place of milk. Use coconut flour in place of potato starch.. I like to cut the mushrooms partly in slices and partly in half slices. Who knows why, I just do. Humor me. Sure looks better than mushroom pieces that have been sitting in a can for who knows how long, doesn’t it? 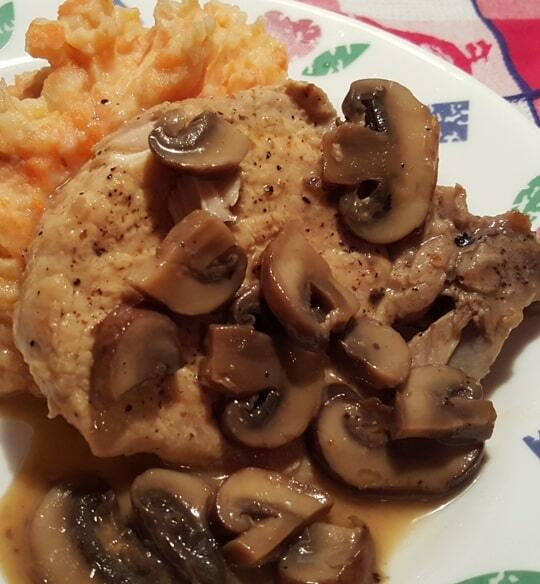 Fresh Pressure Cooker Pork Chops in Homemade Mushroom Gravy just may become your favorite pork chop recipe. It is the favorite among the Instant Pot Community! Cremini Mushrooms pair perfectly in this recipe. They are also called Baby Bellas. They are just small Portobella mushrooms. Button (white) mushrooms are not recommended for this recipe (or anything else really). They have little taste and aren’t very mushroomy, if you know what I mean. Cremini Mushrooms are big on flavor. 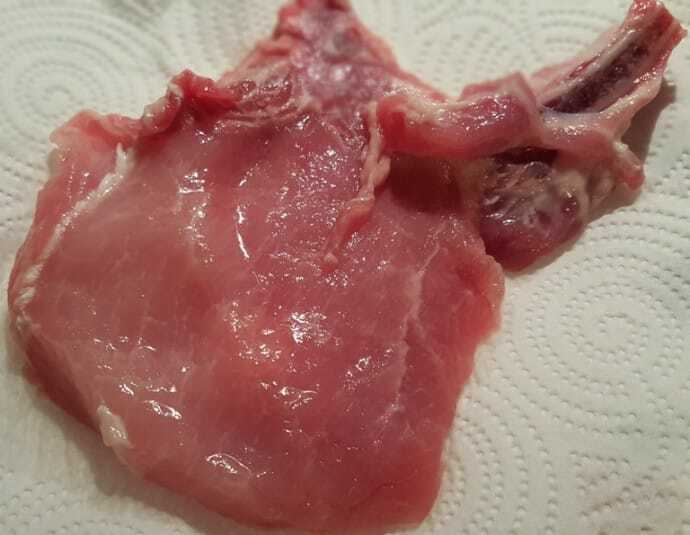 Make sure to rinse your Pork Chops with water, to remove any loose bone shards. Trim the Pork Chops well and pat them dry. Thin to Medium Bone-In Pork Chops are the best for this recipe and will yield the most flavor. Boneless Pork Chops don’t seem to be very flavorful these days and are often times, kind of tough and dry. 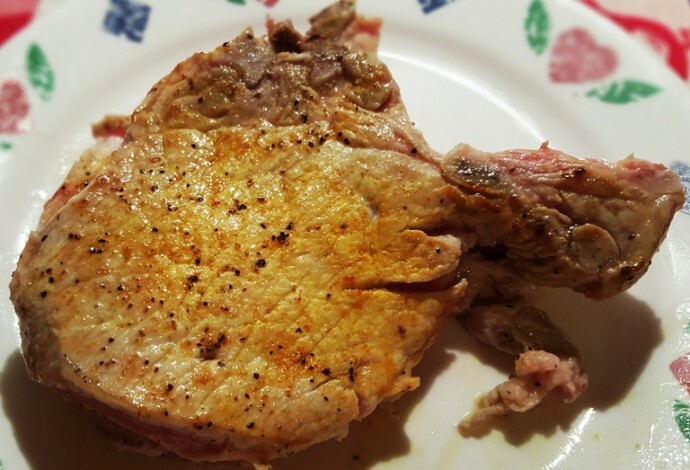 Thick Cut Boneless Pork Chops do not do as well in the Pressure Cooker. Bone-In, is better for juicy chops. I season the chops with my TOG Seasoned Salt Recipe, but you can use store bought Lawry’s Seasoned Salt or any favorite seasoning. I make a large amount at a time, so that my Seasoning Salt is always on hand. 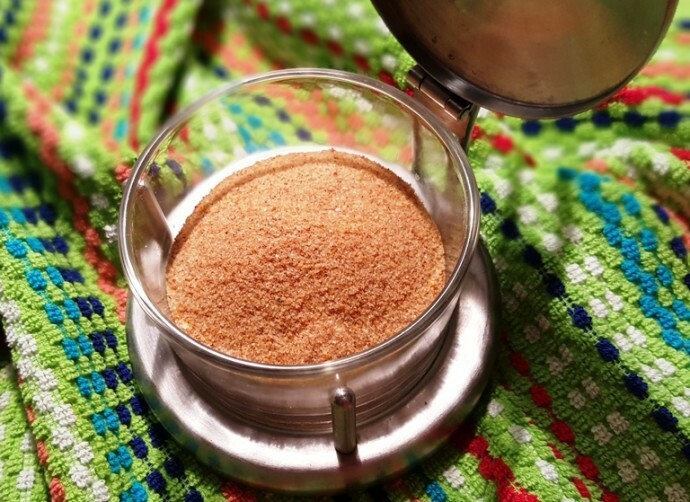 One of my readers swears by Bavarian Style Seasoning for this recipe. 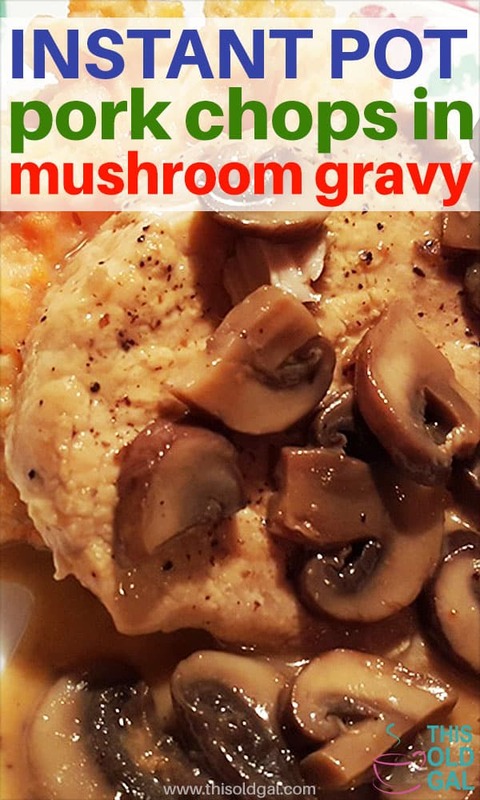 Kathy Betit Gallagher from one of the Pressure Cooking Groups, frequently makes this Pressure Cooker Pork Chops in Homemade Mushroom Gravy recipe. 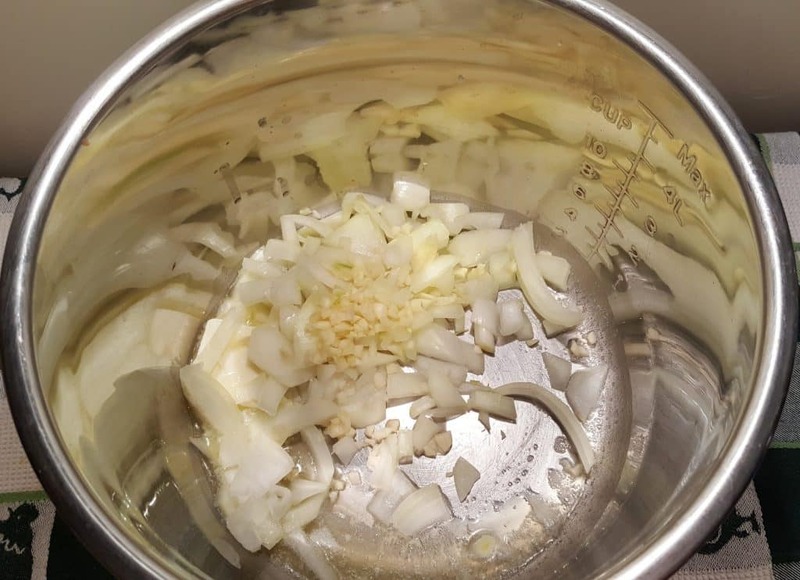 She has posted numerous times in the Facebook groups that she adds onions and garlic before deglazing the pot, which I think is brilliant. Therefore, I have taken her advice and added this option to the recipe. So, if you like go a head and Sauté the Onions for about a minute and then add the Garlic for just about a minute, making sure to not let the garlic burn. Sherry adds additional flavor to the recipe. 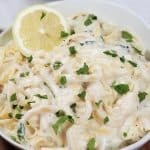 It will quickly bubbly away and help to loosen all those stuck on brown bits (fond) from the bottom of the cooking pot. Shaoxing Wine, which is cheaper, is a GREAT substitute as the result is almost identical. In fact, I use the Shaoxing Wine more than sherry these days. Of course, you can always choose to use broth. As you know by now, I love my Rösle Stainless Steel Flat Whisk and I’m gonna keep mentioning it, until everybody gets one. It is in my top five favorite utensils. 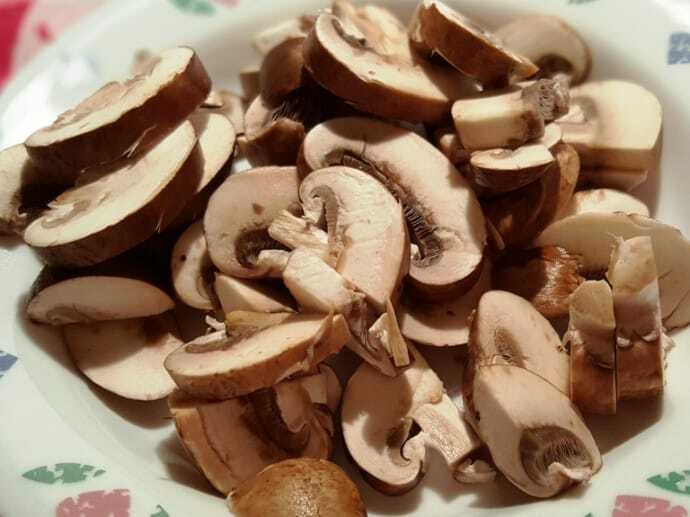 Add in the Cremini Mushrooms…. You’re already thinking, yeah, this looks much better than canned cream of junk, right? I prefer a thinner gravy, so I wrote this recipe for a thinner gravy. However, if you like a thicker gravy, simply dredge the pork chops through potato starch first, before searing. 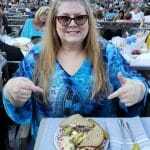 The pork chops and juice that has accumulated on the plate, goes right into the Instant Pot, Mealty MultiPot or Pressure Cooker cooking pot. 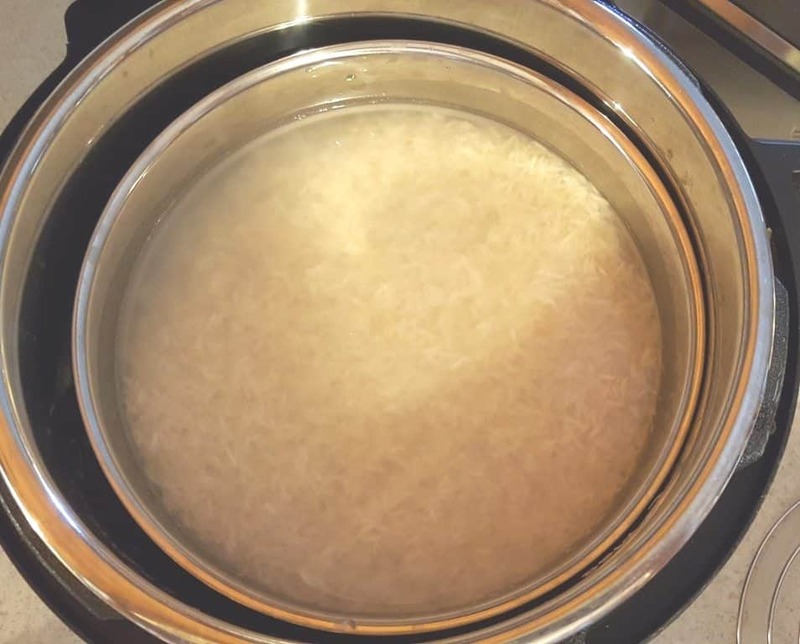 If you would like to cook your rice (or potatoes) at the same time and in the same pot with your Pressure Cooker Pork Chops in Homemade Mushroom Gravy, please check out my Pressure Cooker Perfectly Cooked Pot In Pot Rice recipe for step by step instructions. You will just need these two accessories. One pan from this Stainless Steel Pressure Cooker Stackable Insert Pans set and Stainless Steel Tall Legged Trivet. Can I Cook Potatoes Pot In Pot? Cooking potatoes instead of rice, using the PIP method is a wonderful idea! You can catch all the delicious gravy after mashing the potatoes. If you use thin pork chops, quarter the potatoes and cook for 4 minutes. If you use thicker pork chops, just cut your potatoes in half and cook for 6-8 minutes. Some people quarter potatoes and then simply place them on a Stainless Steel Tall Legged Trivet right inside the Instant Pot, Mealthy MultiPot or Pressure Cooker cooking pot. The potatoes will cook at the same time as the Pork Chops in Homemade Mushroom Gravy. You could even add in raw and halved carrots in with the potatoes, if you like! Once you remove the Stainless Steel Insert Pan with the potatoes, it is super easy to make my Instant Pot Mashed Potatoes, if you chose potatoes. Pressure Cooker Pork Chops in Homemade Mushroom Gravy and Carrot/Potato Mash! Serve up the pork chops over my Pressure Cooker Creamy Mashed Potatoes or my Pressure Cooker Healthy Potato Carrot Mash and a green vegetable. I hope you enjoy this recipe, as much as we do in my home! 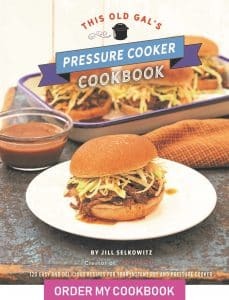 Pressure Cooker Perfectly Cooked Pot In Pot Rice recipe for Potatoes too! Whisk together Gravy ingredients and set aside. Trim Pork Chops, pat dry and season both sides well with Seasoned Salt and then dredge through potato starch. Turn Pressure Cooker to Sauté or Browning and allow to heat. Add the oil to the Pressure Cooker cooking pot and when hot, sear both sides of Pork Chops, one at a time for 3 seconds each side. Remove Chops to a plate. Add Onions and Sauté for one minute. Add Garlic and Sauté for one more minute, being careful not to let the Garlic burn. Add a splash of Sherry or a bit of the broth to deglaze the cooking pot. Scrape up any brown bits that were stuck to the bottom. Add the rest of the broth to the cooking pot. Add in the Mushrooms and gravy mixture and stir until butter is melted. Place pork chops into pot, along with any juice. If making this a One Pot Meal, add the Prepared PIP Rice or potatoes now. Lock lid and close Pressure Valve. Cook on High Pressure for 6 minutes. When Beep sounds, allow a 10 minute natural release. Remove rice/potatoes and trivet. Remove Pork Chops to serving plate. For a thicker gravy, push the Sauté or Browning button and simmer until desired consistency. If you use anything other than cream, add it in after pressure cooking. Crimini mushrooms are baby Portobellos. For super thin pork chops reduce the time to 4 minutes. For thicker chops, increase time to 8 minutes. 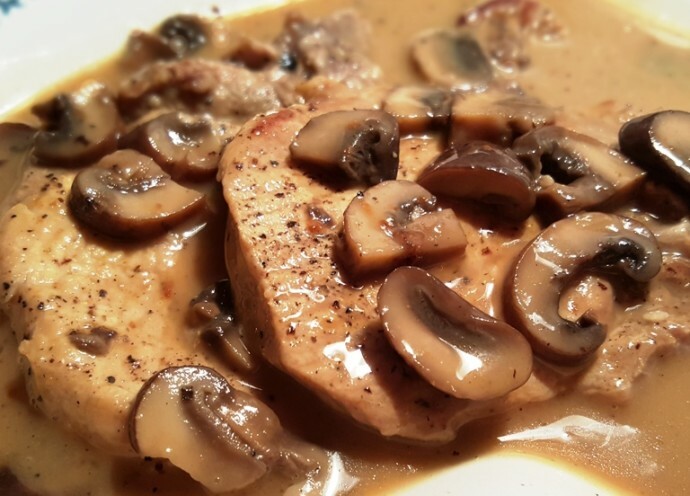 PIN this Pressure Cooker Pork Chops in Homemade Mushroom Gravy recipe! Hello, I’m using 8 bone-in sirloin pork chops. I assume I would increase cooking time? Didn’t know how much longer. Thank you! Hello, I’m cooking 8 bone in loin pork chops…I assume I would increase the cooking time with xtra chops? @Paula Scott — No, unlike a microwave, you do not need to increase the time when you’re cooking more in a pressure cooker. The only “rule” is don’t fill it more than 2/3s full. WOW, This was amazing. So tender and flavorful. My husband and I were totally impressed. Thank you for a gourmet dinner. Can cauliflower be cooked on a trivet with pork chops since we don’t eat potatoes but mashed cauliflower. Was wondering if cauliflower would be mush. THANKS. Wonderful!! Since there are just wife and I, (I’m the cook mostly), I used our 3 quart Instant Pot and halved the recipe. We didn’t have dry sherry so I used dry marsala and plenty of mushrooms. This will be one of our favorite pork chop dinners. Can heavy whipping cream be used and Tapioca starch? Milk and potato/corn starch are not allowed if doing the Keto way of eating. Hi there! So excited to try this next week for dinner. If I use 1-1 1/2 inch no less chops do I need to change the cooking time? Great flavor, but the mushroom soup didn’t quite work.. I suspect I did something wrong. 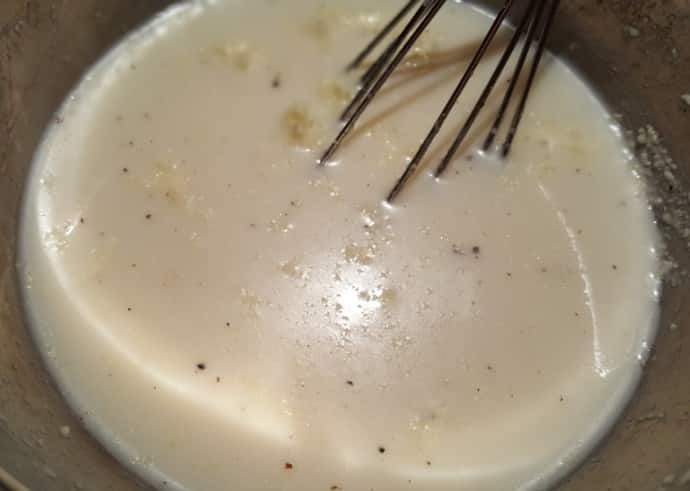 I softened the butter and added it to the milk and corn starch mixture, but this ended up mostly separating, which got worse when I added it back to the pot. How do I ensure that the “soup” is smooth and properly incorporated. I made this for dinner last night. I put a trivet between the meat and mushrooms, and the potatoes. Everything came out delicious. Only thing I did differently was that I used homemade veggie broth instead of bone broth. Mainly because that is what I had. I was afraid I’d get the burn notice with the cream and cornstarch in there but it cooked beautifully. 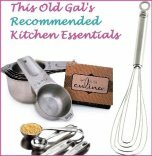 The gravy is delicious, as you recommended, I used baby bellas and they were also wonderful. I made the mashed potatoes with baby yellow potatoes and left the skin on. Mashed them with cream and butter. It was the perfect side dish. This recipe will definitely be going into the dinner rotation. I followed this recipe and it was delicious. My picky 5 and 1 year olds are asking for more gravy. It’s the kind of meal where no one talks. I added a bit of ground mustard to the gravy mixture, Delicious! I had trouble searing the chops because the oil all seems to gather at the outside rim of the pot and they more stuck than seared. Then, even after I deglazed I got the burn message. Suggestions? This was delicious! I added fresh frozen green beans on top of chops, cooked for 6 Minutes & all was perfect! Sooooo tender!! I had a jar of mushroom alfredo sauce that would soon expire, so I used that in place of the gravy and added spinach to the gravy just before serving – delish!! I left a comment a few weeks ago about this recipe sticking to bottom of I-POT and BURN warning came on 3 times during pot in pot cooking (rice above meat). I keep checking for response and advice. Used half and half for part of milk. Scraped bottom of pot initially and each time BURN alert appeared. Could not get to pressure. Thin chops were tough. Amazing. Use the bone-in thin chops – Jill is correct. They are tastier and tender compared to boneless chops. This was absolutely delicious!! Soooo flavorful. I did have trouble with burn notifications though. Stopped pressure once and cleaned bottom of pot and added another cup of broth. But kept getting burn notice. It finally built pressure, but still said burn. I kept hitting cancel and start again. Left it on till it seeming sufficient enough to cook. Pork chops were fork tender delicious. Next time maybe I won’t put in milk in till after pressure cooks. And maybe not dredge chops in potatoe starch.